With limitless access to burgers and fries and no parental supervision, it’s not a surprise that many college students struggle to maintain a healthy diet. Although you can enjoy an occasional treat in the dining halls or a la carte location on campus, constant splurging will lead to more than just weight gain. Poor nutrition will make you feel lethargic and will make it difficult to concentrate on your studies. With a little planning, you can tackle the Miami Dining locations and emerge with a stomach full of healthy food. Calculate what you need. Calorie requirements for college students vary because of differences in activity levels. Rather than worry over calories, eat to appetite and make sure your diet is mostly whole foods including low-fat dairy, whole grains, lean protein, fruits, veggies. Avoid skipping breakfast. Many college students get in the habit of staying up late and rolling out of bed to rush to class. Without food to kick-start metabolism, energy levels will be low and will leave you to be very hungry. This hunger often times leads to overeating by the time you make it lunch. Stop into the market locations or commons locations and grab a piece of fruit, a granola bar, juice and/or a carton of milk to-go. Make a plan. The dining locations on campus offer an assortment of foods. Get familiar with the layout of the dining hall and decide, before you walk through the doors, where you are headed. Walk straight to the salad bar or a certain station, so you won’t be tempted by the desserts (even though they are really tasty). Divide your plate. Instead of loading up 5 plates, limit yourself to a single dinner plate at meals. Fill half your plate with fruits and vegetables, a quarter with whole grains and a quarter with lean protein. For instance, you might have an orange, a piece of grilled chicken, brown rice, a tossed salad. It’s all about the balance. Look at the menu. You can’t eat salads every night of your college career. Review the MyTray online once a week and look for healthy, new foods to try. You might discover a new item you want to try or learn about our expansive vegan and vegetarian options. 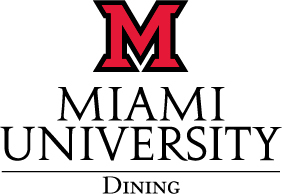 Here at Miami, we are lucky to have an on-staff dietitian and nutritionist, Ashley Blust. If you are feeling overwhelmed by options at the cafeteria, Ashley will be able to help you devise a set meal plan.